The concept of hacking is undeniably cool, but even video games built around the idea tend to simplify the complex act into a single button press. 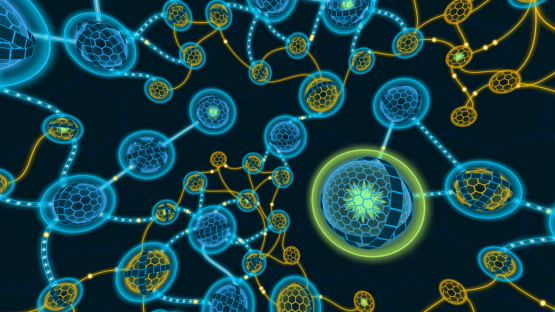 While major releases may shy away from the actual act, PlayStation VR puzzle game Darknet is fully focused on it. 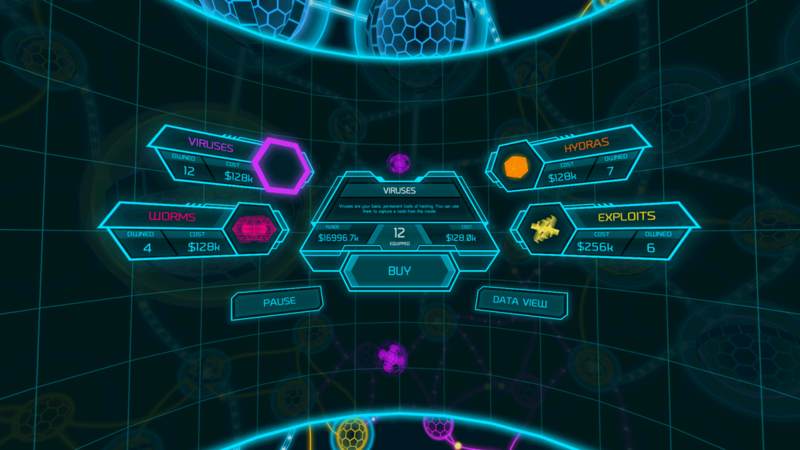 Players get to play the role of a hacker as they have to capture various nodes in order to steal money, and information from secure networks. Hacks start off pretty simple, as players apply a virus to various nodes on a grid. Once infected, a node continually extends on the grid until it either hits the core (which results in a successful hack), or a healthy node (which will then cancel the hack). It’s up to the player to infect the right node so they’ll hit the core without resetting the hack. It may sound complicated written out, but thankfully a solid tutorial walks the player through the actions, and it quickly becomes second nature. Every successful hack results in money earned, which can then be used to buy new hacking tools. These include additional viruses (making it so the player can select multiple nodes instead of just one), and other tools (hydras, exploits, and worms) that impact the overall network in various ways. The goal in each network is to successfully hack the core, but to do that players will have to solve many smaller puzzles so they can buy enough viruses, and exploits, to make the final challenge feasible. Once a network is fully hacked, the player is kicked out to the main menu. The information they worked hard to earn isn’t gone, though, as it manifests as experience points that can be used to purchase various bonuses that will make later hacking missions easier. These range from starting with more money (so you can purchase multiple viruses from the very start) to being able to unlock harder missions (that result in more experience). While solving the grid puzzles is a major focus, how the player tackles the network is just as important. Each hacking mission has to be completed within a time limit, and sloppy play can leave the player at a major disadvantage even if they are solving the puzzles with ease. Tools like hydras and exploits need to be used efficiently, as they take over vulnerable nodes automatically and destroy shields, respectively. Learning to use these correctly is just as important as the procedurally generated grid puzzles. What keeps Darknet enjoyable is that the player gets to choose what difficulty the hacking missions are. That means players can wait until they have more abilities unlocked to tackle the truly difficult ones (which have to be purchased in-game), and clearing these difficult missions is really satisfying as it’s not only a mental test, but one where the player is racing against the clock. As I can attest from personal experience, it’s definitely a bummer to fail a mission that took up 25 minutes of my time, but it’s even more satisfying when a key piece of information is hacked with mere seconds remaining. While I was immediately able to grasp the puzzle mechanics, the movement in-game never felt totally comfortable. This is due to the hacking taking place in a full 360-degree space. That’s fine if you’re standing up and don’t mind constantly turning, but the solution for couch play isn’t as elegant. I could use the right analog stick to move my view in 45-degree angles, but this still would often put key objects away from the center of the screen. It’s too bad there wasn’t different camera control options, as having slightly more freedom would’ve allowed me to keep puzzles feeling more centered. It’s also worth noting that the gameplay is heavily impacted when PlayStation VR experiences tracking issues, so if your setup is prone to error, then it’ll be pretty difficult to play the game properly. This isn’t the game’s fault, as it’s a hardware issue, but once the game thought I was pointing my controller at three o’clock despite me pointing straight forward. The issue was fixed with a restart of the console, but this game is practically unplayable when hit by PlayStation VR’s less than stellar hardware performance. Similar to SUPERHOT, the hacking in Darknet is just a VR experience taking place in a greater world. This is communicated through in-game news stories that are unlocked while playing. These paint some bleak pictures as Senators are indicted on bribery charges, oil spills are happening, and other disasters go on while the player is spending their time in the deep web. It’s a fascinating extra that adds a lot to the overall experience, and makes it feel like not yet another puzzle game. Darknet isn’t the flashy PlayStation VR game that you’ll show to friends, but it’s absolutely one of the best games available for the headset. The puzzles are consistently challenging, and battling against the clock makes for an intense affair. The experience is really brought together by the inclusion of an interesting game world, that kept me interested enough to continue playing well after the freshness had worn off. Review code for Darknet provided by publisher. Reviewed on PS4 Pro. For more information on scoring, please read our Review Policy here.